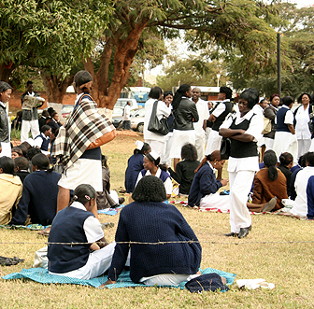 Government has released K12 billion towards offsetting the K120 billion debt owed to health workers in the country. The Ministry of Health owes health workers in leave travel, long service and repatriation benefits among others. Health Workers Union of Zambia General Secretary Lewis Mukosha confirmed the development in an interview with ZNBC News in Lusaka, Monday. Mr. Mukosha said government has made an undertaking to offset the debt for his members. He has asked provincial medical officers countrywide to compile audited lists of health workers that are owed. Recently health minister Kapembwa Simbao announced that Government had set aside funds to liquidate the debts owed to health workers. And Mr. Mukosha also disclosed that about K134 billion has been set aside for health workers in the Sixth National Development Plan. Just 10 % of the required amount ? A tip of the iceberg i guess. Why let these figures balloon to K120 bn before you settle? Some beneficiaries may have since died without getting their dues. If we can easily find billions to fund useless countless by-elections, surely we can pay poor workers dues on time. Let’s also ensure these lists are thoroughly audited; I don’t trust Min of Health HR dept ever since the Kapoko saga! For all we know, this cash may end up in someone’s bank account (to be spent on Hummers and building mansions in Chalala). This is what is called vote buying but at least it will help our suffering Zambians. Decisions made are only favourable to Zambians when there is an election, so this is the best time for anyone to claim anything from government. It is a shame for the GRZ to owe its employees what is due to them no matter how much and worse still many have died without their hard earned benefits. I think the GRZ must be the worst employer ever. This explains the frustration of GRZ workers who have resorted to helping themselves to whatever they can lay their hands on. K120 billion ( about $25 million) is about what the govt spends on ministers’ fleet of cars and other luxuries. Start paying them now including interest. Rupiah’s rich and corrupt Government is bankrupt. It is time they vacated the national offices. Campaign efforts in futility because workers are already frastrated and decided of who to vote for. They also need decent salaries and reasonable housing allowance not the k200,000 insult they get for housing allowance. You cant manipulate the workers as they are enlightened,try villagers. Bashir of Sudan wont seek re-election in next election. He has seen the wind of change sweeping across the Arab countries in North Africa and Middle East. The wise are heeding to the cry of their people but the foolish ones they will talk like Museveni. We all want to enjoy our sweat not some just eating fruits on top of others. MMD you remove the office of abus clause from the ACC act so that you can still at will. I hope you are learning something from North Africa especially now in Libya. A hungry person is an angry person. The govt should pay all the outstanding claims or money they are owing workers. They have money for by-elections. We are watching from here and coming back to claim our money before the tripartite elections. I left my money keep it safe and stupid (KISS). Zambians have failed to govern themselves, it calls for millitary intervention. Guys find me on fb under the group name STAND UP AND FIGHT FOR ZAMBIA join in and lets have a discussion about the problems our country is undergoing and what you and I can do about it. one other thing andy is that discussions should be based on facts not hear say, i thing that is what brings confusions.